Staying on top of industry news is something we think matters for any professional whose success depends on being well informed. With all the news websites, blogs, tweets and newsletters out there, staying in-the-know can be time consuming and it’s increasingly hard to figure out what matters most when reading news across multiple sources. We’re very excited to announce the launch of LinkedIn Today, which delivers the day’s top news, tailored to you based on what your connections and industry peers are reading and sharing. If you only have five minutes to catch up on news, LinkedIn Today can help you cut through all the clutter, so you can discover the top headlines you need to read to be better informed everyday. LinkedIn Today is unique because it gives you three social views of professional news that don’t exist together in one place anywhere else on the web. We can deliver news that matter to your connections, your industry peers, and the wider professional audience. 1. 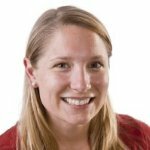 What your connections and coworkers - people you know - are sharing. You know and trust most of your connections and coworkers, so if they share an article, it’s a good signal that it’s something you should be paying attention to. By looking at the news articles being shared across your network and who is sharing it, we can highlight the top stories you should be paying attention to. Second, LinkedIn Today can surface the top few stories you need to read today to be informed on what’s happening in your industry or the industries you care about (for e.g. the Internet industry). We’ve heard from a lot of users that they may work in one industry, but they pay attention to news across multiple industries. For example, maybe they need to stay informed on the industries of their clients, or maybe they closely follow news in the industry they want to work in next. By following industries, you can get the relevant news on your Front Page and in the top navigation. We’ll also send you a weekly email of the top industry headlines across all of the industries you follow. And, no matter how many industries you follow, we will only send you one news email per week. Take advantage of the wisdom of the (professional) crowd, and see how news is trending across industries. Let’s say you find a story that’s one of the top stories in the Internet Industry – LinkedIn Today can also show you what other industries are sharing and discussing this story to help you connect the dots about the news. Another unique aspect of LinkedIn today is the ability to follow multiple industries, and then find the top news across all of those industries in one place. Let’s say you work in the internet industry, and sell to customers in the healthcare industry. With LinkedIn Today, you can follow all of the industries that you care about (Internet, staffing & recruiting, and healthcare), and then come to one place to get all of your news. 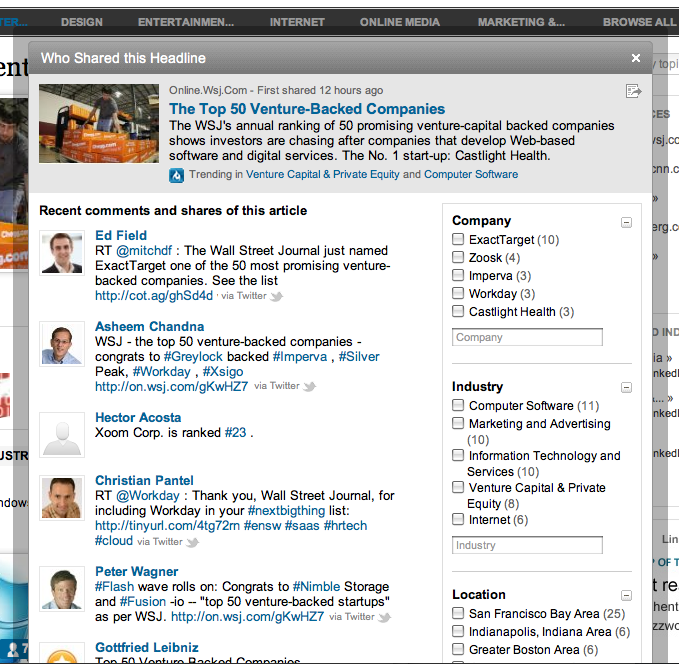 Within any story that’s being shared, you can drill down to see who’s shared a given headline. We’ll show you the professional identity of the users who shared the story, along with what they are saying to get a sense of the conversation happening around a given article. You can even narrow your results with filters like industry and company. Only LinkedIn gives you this layer of professional identity and search capability on who’s sharing or tweeting an article. We are very excited to announce that LinkedIn Today is launching as part of the LinkedIn iPhone app as well. A lot of professionals read news on the go, so we wanted to have an easy way for users to get the top of the day, wherever they are. Two unique features of the News app on the iPhone includes both the ability to see what your connections are reading and an option to save articles. 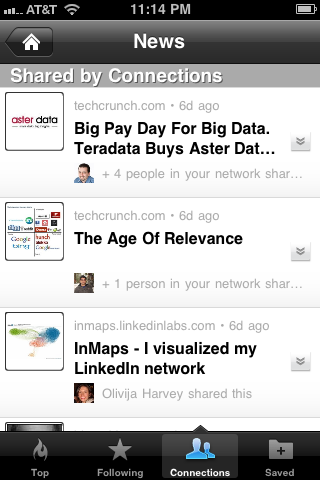 Any articles saved on the iPhone will show up under "Saved" on linkedin.com/today, and visa versa. We hope you enjoy LinkedIn Today, and that it helps you stay more informed in less time, while also allowing you to discover new and entertaining articles and sources. 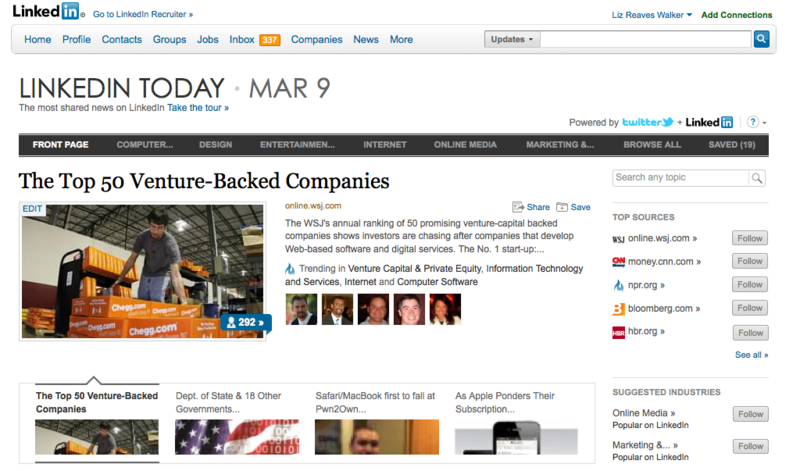 Today, all users can go to www.linkedin.com/today to see the day’s top headlines. Over the next few weeks we’ll be ramping up entry points on the homepage and in the navigation. 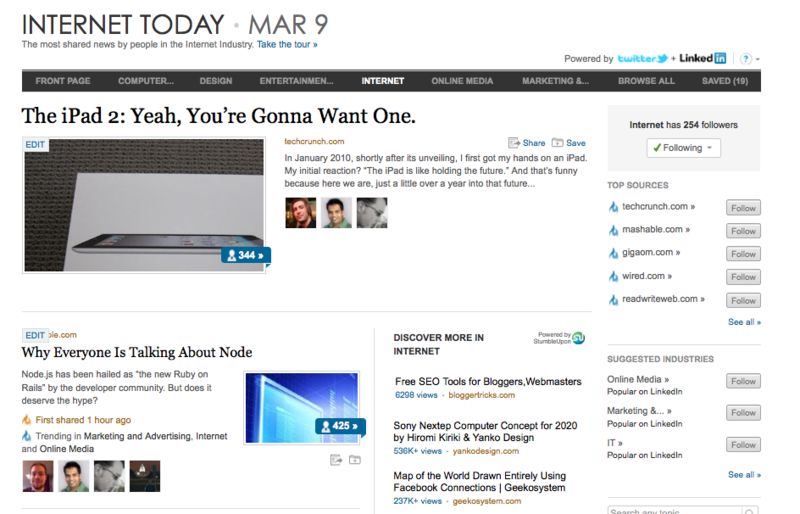 (In the meantime, go to the more menu > News to access LinkedIn Today). We are very excited to get your comments, feedback, and suggestions.